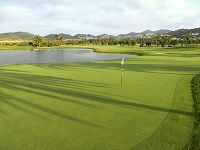 The luxurious resort of La Manga Club is set amid the rolling hills of Murcia in southeast Spain. Lying to the south of the Costa Blanca, this region is known as the Costa Calida, or 'warm coast', thanks to its mild, year-round Mediterranean climate. La Manga is an award winning Leisure Resort, self-contained, with bars, restaurants, the La Manga Hyatt Regency Hotel, Las Lomas self-catering holiday village and three fantastic golf courses. There are several beaches nearby, including the La Manga beach club. Murcia airport is just 20 minutes away, while it’s one hour to Alicante.